Grace to you, and peace, from God our Father, and the Lord Jesus Christ. Why are none of you even looking concerned that I might float away to heaven during my sermon? This came from the internet; it’s real! And look, I didn’t wear boots today to help hold me down, so this is a real danger! Ok well, maybe you all know me better than I thought. Maybe you know I’m not all that. Maybe you know what a sinner I am. Or maybe you realize the folly in astrology. Maybe you even realize it’s more than folly. It’s dangerous. It doesn’t honor God, and it gives Satan a wider opening to reach into our lives. An old friend of mine, someone I haven’t seen in person for quite a while, has recently been posting horoscopes on social media for all to see. I became more and more disturbed as this continued, and after some thoughtful prayer, I decided I needed to say something. Predicting the future through the use of astrology is a form of the occult, even if you’re just reading these things for fun. It is not just quackery. It is not harmless. These things are mentioned repeatedly in scripture and directly forbidden by God. We are to depend on the Lord alone to lead us through this life, and especially in times of trouble and uncertainty, we should lean on him, not some bunch of nonsense we see on the internet, and definitely not on the occult. Let us pray. Almighty Lord, keep us, your loving children, safe from the forces of evil we don’t understand. Help us to turn to you alone for guidance and to trust your Word to lead us in faith. In Jesus’ name. Amen. It’s one thing to pull a tiny slip of paper out of a fortune cookie, laugh when reading it with your friends, and then throw it away. It’s quite another to faithfully read your horoscope every morning, and then look for those predictions to come true as you go throughout your day. I don’t mean to just pick on horoscopes; the occult takes make other forms too. It’s tempting though, if God seems distant to you, or if he isn’t giving you the answers you’re seeking, to find someone or something that will. But truth and wisdom come from God, and when we seek those things in any other manner, we are in dangerous territory. In our reading today from 1 Samuel, King Saul does this very thing. Not with his horoscope, but by consulting a medium. He knew better, of course. In fact, he ordered that all mediums and wizards should be driven out of the land. He forbade any practice of the occult, and commanded the people to trust in the Lord alone. Yet, when he found himself on the eve of battle, the pitch of fear in the face of the enemy overwhelmed him, and because God didn’t answer or reassure him, he sought someone who would. We do this in our lives, don’t we? If we have a big decision to make, or we’re seeking some confirmation that our lives will work out just the way we want them to, it’s tempting to circumvent God altogether. After all, his soft whisper is so much harder to hear than the loud, clear voice of someone else, someone without God-given authority to speak, someone we don’t have to wait on for an answer to our prayers and questions. Scripture tells us that false prophets are everywhere in this world, and as the apostle Paul warns us, “For the time is coming when people will not endure sound teaching, but having itching ears they will accumulate for themselves teachers to suit their own passions, and will turn away from listening to the truth and wander off into myths” (2 Tim 4:3-4). Satan lies in wait, hoping we will succumb to this weakness and our ears might be inclined toward a false prophet, speaking deception to us in the guise of God’s truth. As our gospel reading today explains, there is no middle ground. There is strength in unity, and a divided house will not stand. Jesus says, “Whoever is not with me is against me, and whoever does not gather with me scatters” (Luke 11:23). You’re either a follower of Christ, or you’re not. You can’t just read your horoscope only occasionally, or consult a psychic a little bit, because even a little bit of danger is dangerous. 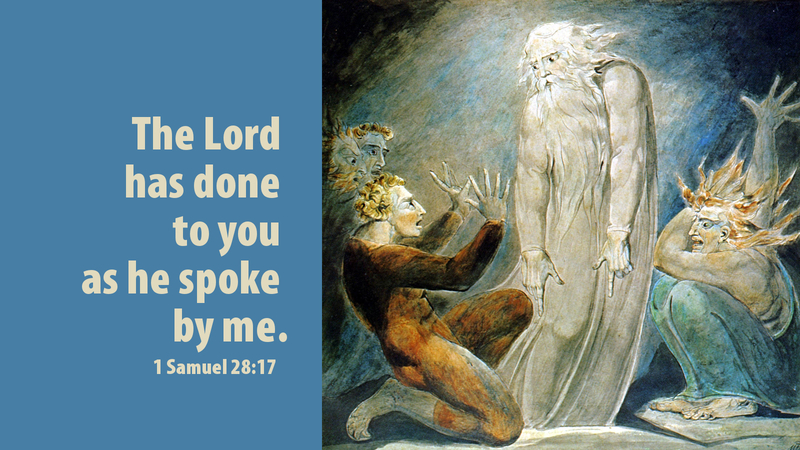 Beginning in verse 16, Samuel says, “Why then do you ask me, since the Lord has turned from you and become your enemy? The Lord has done to you as he spoke by me, for the Lord has torn the kingdom out of your hand and given it to your neighbor, David” (1 Sam 28:16). He goes on to tell Saul that tomorrow he and his sons would be dead, with him. Not quite the ending Saul was hoping for, but that is exactly what happened the next day, a stark reminder that God is in control and will always have the last word. It’s very easy for us to forget scripture’s admonitions against the occult, and God’s warnings to trust in him alone and be alert for false prophets. It’s easy to not see beyond the narrow focus of our lives in the present. It’s easy to think Satan is just some cartoon character, or the antagonist in the story, the foil who opposes the protagonist of Christ in the biblical literature. But faith tells us this isn’t just a story about good and evil. Satan is very real, and Jesus has very definitely conquered him. The Book of Revelation tells us, “And the devil who had deceived them was thrown into the lake of fire and sulfur where the beast and the false prophet were, and they will be tormented day and night forever and ever” (Rev 20:10). For while Satan’s power on earth is limited by God now, in the end times his power will be cut off completely. In the meantime, Christ has given us armor, and we should remember that often a great deal of the battle is not offensive, but simply enduring the attacks of the enemy. Perhaps the greatest of this armor is the shield of faith, with which we can “extinguish all the flaming darts of the evil one.” The devil focuses all of his cunning into separating us from the Word of God, which is the kryptonite that he desperately fears. We’re told to trust in the Lord alone, but how do we know that God will protect us from such evil? Because.. he already has. The battle against evil has already been won for you. Through his death and resurrection, Jesus was victorious. So now, we trust in his victory. There’s an old saying that “You are what you eat” but it’s also true that you are what you sin. When you drink too much and it begins to control you, you become an alcoholic. You take on the title. You become this. It becomes you. If you were a C or D student in school, you were labeled as such, and your report card said so. We become what we’ve done. And when Jesus took your sin upon himself, he became your sin, so you wouldn’t have to. He became your sin, and it died with him and it descended into hell with him. You have been set free. You are no longer bound in chains. The Law convinced you this sin was yours forever, but the Gospel of Jesus Christ has set you free. He took so much of your sin — all of it — that he became the very sin that you cannot now even feel. He became sin, and gave you faith to believe. Your sin is gone. The devil has nothing to hold over you now. Satan can only hurt you if God allows it, or if you invite him in. There’s enough evil in this world for us to deal with already, without us seeking it out. Don’t go looking for trouble, in other words. You might find it, just like King Saul did. I walked into Walmart a few years ago, and as I grabbed a cart and entered the main part of the store, I could see some commotion happening many aisles down, about three-quarters of the way back. There were people gathered around a woman who was talking. I thought she must be a vendor handing out coupons or food samples or something like that, so I didn’t pay too much attention. But as my shopping brought be closer to that end of the store, I saw people who’d been talking to her, walking away with fliers she’d given them, advertising her services as a psychic reader. She had set up shop in the cereal aisle, with a shopping cart as her base of operations. There were no groceries in it, just a stack of these fliers she was busy dispensing. I was irritated by this, by the boldness of it, and by the evil I saw there, drawing people away from God and toward deception and lies. I decided that I would not stop and listen, nor would I just pass by her, politely decline her flier and keep shopping, as so many others were doing. This I was just not going to stand for. So I asked the Lord to give me the words, and I pushed my shopping cart down that cereal aisle toward her. By the time I reached her, I knew I was going to tell her, “Jesus doesn’t want you doing this.” But I never got the chance. When I was still a few steps away, everyone else left, so there we were, just the two of us, and only a few feet apart. Our eyes locked, and no words were necessary. She looked intently and deeply into my eyes for a few long seconds. And then she picked up her stack of fliers, left her shopping cart behind, and walked straight out the nearest exit. As I watched her leave, I silently praised the Lord for his goodness and protection. When that psychic looked into my eyes, I am not who she saw there. The Spirit of God is in me. I belong to Jesus. And so do you. Trust in his victory. Satan doesn’t want you to realize it, but it is finished. Remember that you have something King Saul did not have…and I don’t mean your horoscope. You have Jesus. Hold tightly to him alone.